(Verso) wet stamp in black ink, at left center: "CREDIT PHOTO BY / WEEGEE / THE FAMOUS [encircled]" (Verso) wet stamp in purple ink, at lower right center: "WEEGEE / 451 WEST 47th STREET / NEW YORK CITY, U.S.A. / TEL: 265-1955"
(Verso) inscribed in pencil, at lower right corner: "8764"
January 16, 1941. Gunman doesn't want his picture taken. Police today permitted photographers in the line-up room at headquarters. The subject was Anthony Esposito, under indictment with his brother William for the murder of a businessman and a policeman in Tuesday's tragic Battle of Fifth Ave. The detectives, manacled to Esposito, didn't want their names or pictures in the papers. They obliged by turning around, holding the gunman by head and arm so he couldn't duck. The yardstick is on the line-up platform where Esposito had stood, refusing to answer questions. "He looked like a stubborn surly, snarling animal," Weegee reported. "He stumbled and sagged over to one side, like a drunk." 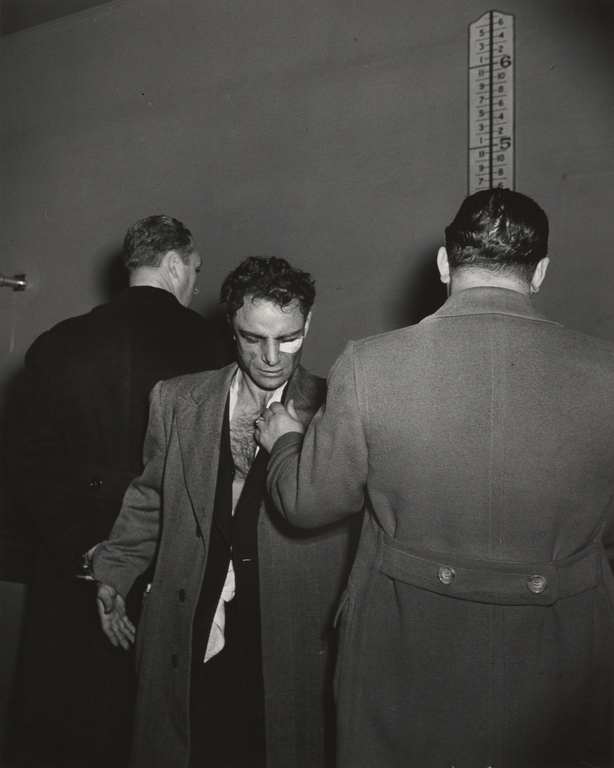 New York tabloid photographer Weegee created this image of a murder suspect in his aggressive trademark style. Standing back about six to ten feet with his Speed Graphic camera, he blasted his flash, giving Esposito a vulnerable look. This visual starkness is relieved only by Weegee's impeccable sense of humor, which he expresses by emphasizing the details of the detectives' trench coats and the height chart that appears to emerge from one's head.